When my mother first came to the United States in the late 1970s — the young Korean wife of an American soldier who'd just finished his tour near Incheon, Korea, where they'd met — her biggest challenge wasn't the language barrier. It was the food. The Southern country cuisine that her Tennessee in-laws prepared was too foreign, and my mother found herself missing the food of her country so much that she refused to eat. Everything was either too coarse, with salty seasoning — why would anyone boil greens with the fat of pigs? she wondered — or thick and meaty. In America, she thought, people didn't seem to enjoy food simply for what it was. The corn was slathered in butter, the beans drowned in pork and gravy. People here even put salt on their tomatoes and apples. "It make me so sick to stomach," she recalls, her English a little rough even after all these years. "You daddy, he and Uncle Don drive to five grocery store to find me what I need to make kimchi." She needed Napa cabbage, fish sauce, green and white onions, garlic, sugar, ginger and red chili powder. Kimchi is a fermented vegetable dish that can be used as either a side or cooked into rice or jigae (soup) to be the main course. 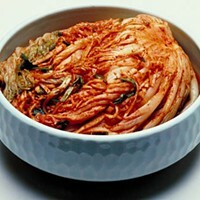 It is Korea's most well-known food. Fast-forward to 2006, when I first moved to North Carolina. I found myself in a similar situation to my mom's. But while she was left longing for the dishes of her homeland because she'd moved across the world, I was left longing for the dishes of my mother's culture because I'd never bothered to learn how to make any of them for myself. 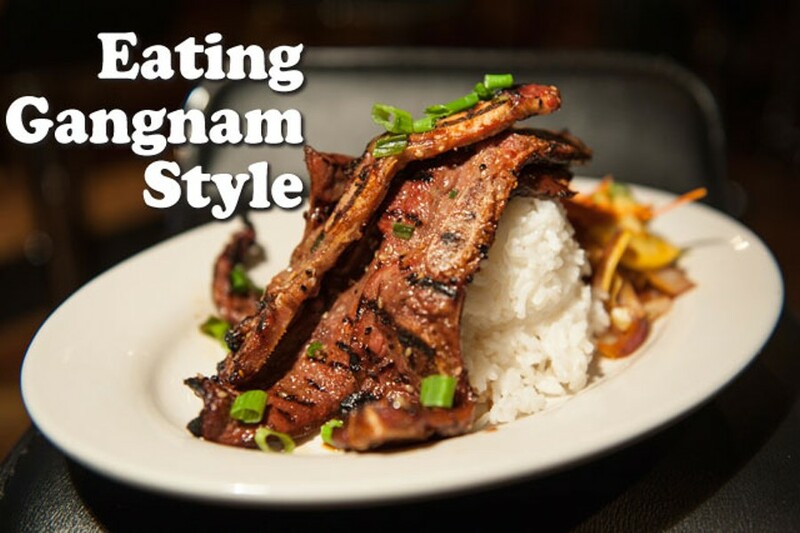 Unlike Japanese, Thai and Chinese food (at least one of which you're sure to find in nearly every shopping center food court), Korean cuisine takes a little more effort to discover in Charlotte. 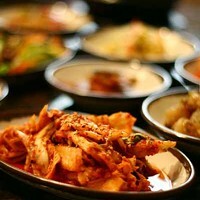 Today, there are four local restaurants that serve authentic Korean dishes. Miyagi's, which opened in NoDa late in 2012, is the latest to explore the underrepresented culinary culture — albeit nontraditionally. While the menu at Miyagi's features the Korean dishes I know and love — kalbi (short ribs), bibimbap (a bowl of rice topped with vegetables, meat, a fried egg and a chili pepper paste called gochujang), bulgogi (a grilled, thinly sliced, marinated meat), mandu (dumplings) — there are other items listed that took me by surprise. For example, salmon makes an appearance under the barbecue heading. Salmon? "It is a really good dish," says owner Raymond Dover, 31. "I just throw on a nice scallion sauce, sear it, a little bit of butter, garlic, soy sauce ... patrons love it. We don't do it in Korea, but I know what my market wants." 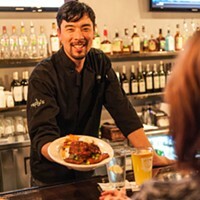 Dover, a Korean-American who was born in Fayetteville, admits he's received some criticism on the authenticity of his dishes. 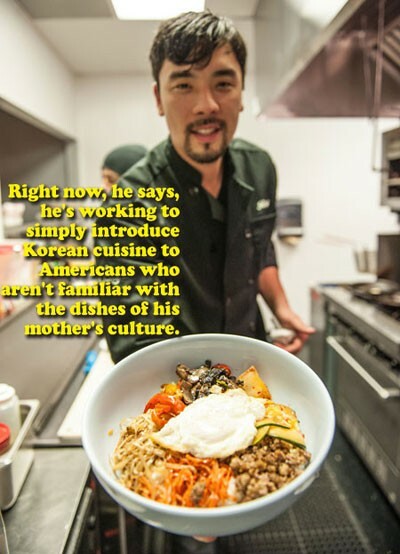 But right now, he says, he's working to simply introduce Korean cuisine to Americans who aren't familiar with the dishes of his mother's culture. In essence, he's not targeting me — the half-Korean chick who's thinking about and missing her mom when she breaks apart a set of wooden chopsticks to scoop up some sticky rice. He's targeting people who want to try something different. 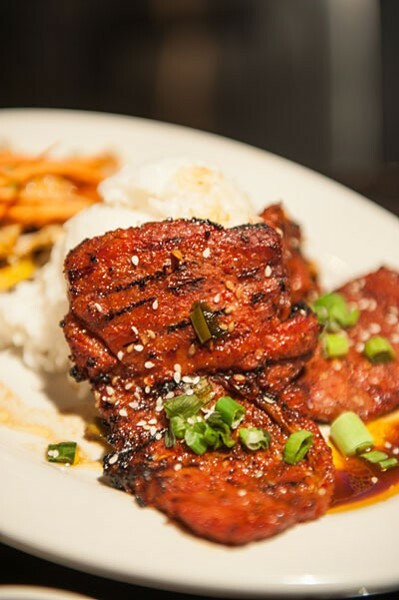 "When I first started serving the spicy barbecue pork, it was pork belly. Customers complained it was too fatty," he says. "I thought it was amazing; it had a nice crunch to it, the outer skin was like a thick bacon." But Dover listened, and now the spicy barbecue pork is made with pork roast. For me, the ultimate test of authenticity for any Korean restaurant is whether it measures up to my mom's cooking. Yeah, I know — that's unfair. "I think Asians, Koreans in particular, are the most critical people of their own food. Very critical," Dover says. Yep! Others might look at the banchan for authenticity. That's the side set of dishes that come with every meal for everyone at a table to share. 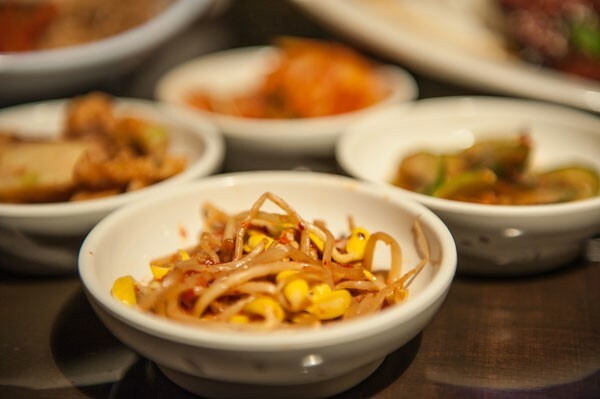 Some say the more banchan that is offered — examples include kimchi, pickled seaweed, kongnamul (spicy bean sprouts) and ggakdugi (pickled daikon radish) — the better the restaurant. But that doesn't matter much to me. What I want to know is whether the kimchi is fresh or sour — is it gutjeri kimchi or shin kimchi? Some people love sour kimchi (an indicator that it was made some time ago). Not me. At Miyagi's, the kimchi was doable. I didn't scrunch up my face when I bit into the cabbage, but it definitely wasn't just made that day. And that's OK. 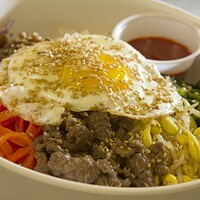 In time, Dover promises me, the menu will expand to include the hotter dishes and soups of Korean cuisine. "We're working on getting the hot pots. We are getting stone bowls. We are getting grill tables. We're going to continue to keep tweaking." Thinking back to my mom's first experiences here in the States, it makes sense why my dad and uncle had such a hard time finding those elusive ingredients 35 years ago. His family lived in a small town in the mountains near the Tennessee-Virginia line, with a mostly white population. Napa cabbage, which originates from China, probably wasn't in high demand back then. But Charlotte, especially in the 2010s, is not a small city. And yet there are few Korean eateries in this area. By comparison, Atlanta has Pleasant Hill Road in nearby Duluth, which offers a variety of Korean options, from barbecue to bakeries. If those intimate restaurants seem intimidating (I'm half Korean, and I still avoid those seemingly rude ajumas, older women, at all costs; you never know what they're saying), Atlanta also has prepared foods at the Korean-owned grocery store H-Mart, comparable to Target or Wal-Mart, with numerous locations throughout that city and its suburbs. All hope is not lost, though. 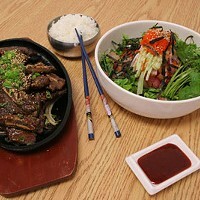 Charlotte does have Cho Won Garden on Independence Boulevard, which opened in 2008, for a full Korean barbecue experience. The space is large, offering room for a few grill tables. If you want to leave smelling like mouth-watering grilled beef or pork, sit there. The banchan is plentiful. And for the record: Every time I've visited Cho Won Garden — not as often as I'd like because of price and distance — the kimchi has been on point. If you're looking for a little something to curb the longing for Korean food, like an addict needing a quick fix, PePeRo (located in the back of a small Korean grocery store in Matthews) and Korean Restaurant (yes, that's the name), located in Super G Mart, are ideal options. At these places, you won't find ambiance or Asian décor. You will, however, find Koreans chatting over bowls of Doenjang jjigae, soybean paste soup, and paying you no mind. In reality, nothing measures up to my mom's cooking. She knows it, too. The last time I visited home, she sent me back with a jar of ggakdugi, a large bag of rice and a container of uncooked seasoned bulgogi to pan-fry for dinner the next day.